The Illusion of Life: Dave Smith Takes Us Behind the Slipper for a Look at Walt's "Cinderella"
Dave Smith Takes Us Behind the Slipper for a Look at Walt's "Cinderella"
It's hard to call one film the most beloved in the Disney canon—but "Cinderella" must surely rank right near the top of the list. Maybe it's the timeless appeal of justice winning out over tyranny. Maybe it's the beautiful songs. Maybe we all wish for a Fairy Godmother. Whatever the reason, "Cinderella" has warmed the hearts of millions, and Cinderella remains a favorite Princess among little girls (and grown-up ones too). Insider: How did "Cinderella" influence other Disney animated films? Dave: If "Cinderella" hadn't been a success, there probably would not have been any other Disney animated features. Walt had just gone through a difficult decade, notable for World War II, and ... the company had had major financial problems. After" Bambi," in 1942, Walt had been unable to get the financing for another full-length animated feature, so he had to be satisfied with package features, like "Make Mine Music" and "Melody Time," which combined a number of short cartoons. Finally, by the end of the decade, he had been able to scrape together enough cash to do "Cinderella," and the whole future of Disney animated features rested on its success. Thank goodness it was a big hit! Why was Walt so attracted to fairy tales as source material? Walt felt that when he used a fairy tale there was already a built-in audience for his film, because the audience members already knew a little about the story, and would be curious to see how Disney would depict it. "Snow White and the Seven Dwarfs" had been such a big hit, while following films, not based on fairy tales, had not been. He felt that if he attempted another film based on a fairy tale, it might match "Snow White's" success. Can you talk a little about what added to the story? The tale of Cinderella was well-known, so mainly Walt had to find a new way of telling it, and he accomplished that by introducing additional strong characters, such as Gus and Jaq and the other mice, the birds, Bruno the dog, and Lucifer the cat. They helped carry major parts of the story. Walt also added the King and the Grand Duke to the tale. Nothing showed off the abilities of animation over live action more than the exciting transformation of Cinderella and the Pumpkin Coach by the Fairy Godmother. Why do you think "Cinderella" has resonated so much with audiences? "Cinderella" tells a timeless tale—the poor, abused, downtrodden little girl who has great hopes and aspirations, and despite those who try to hold her back, is finally able to fulfill those aspirations in an even grander scale that she could have ever hoped. So many people yearn for the same magic that the story has continued to be meaningful to generation after generation. As Leonard Maltin has said, "The film's strongest point is its ability to elicit emotional response from its audience." Can you talk about Cinderella's Castle at Walt Disney World? Why Cinderella? Walt Disney had originally intended to name his Disneyland castle after Snow White, but then made the switch to Sleeping Beauty because he had the "Sleeping Beauty" film in production and naming the castle would help promote it. 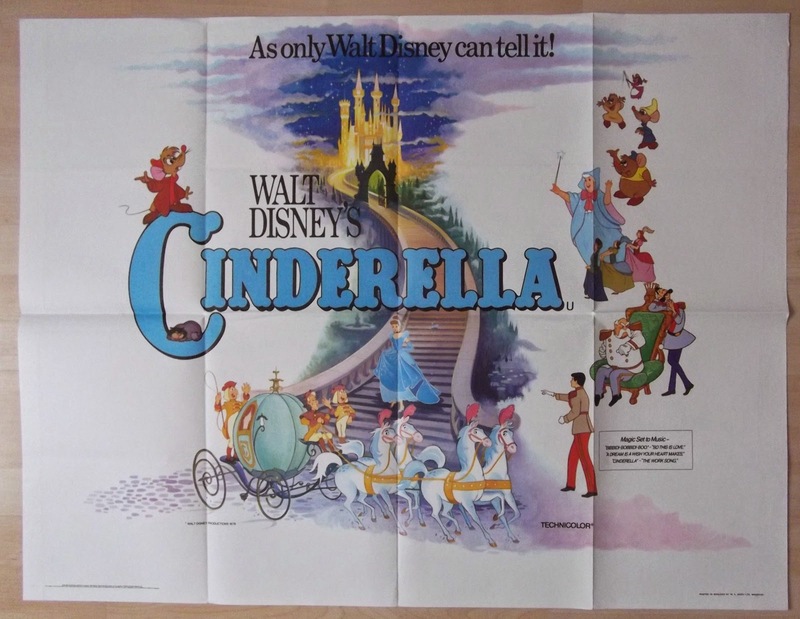 By 1971, Walt was gone and there were no more fairy-tale movies in the offing, so the Park's designers decided to return to the Cinderella story as the inspiration for their new castle. They wanted it to be different from the Sleeping Beauty Castle, and Cinderella seemed to fit the bill. It would be a grand, majestic castle, more than 100 feet taller, so as to fit the larger scale of Walt Disney World's Magic Kingdom. Are there any items in the Archives related to Cinderella? 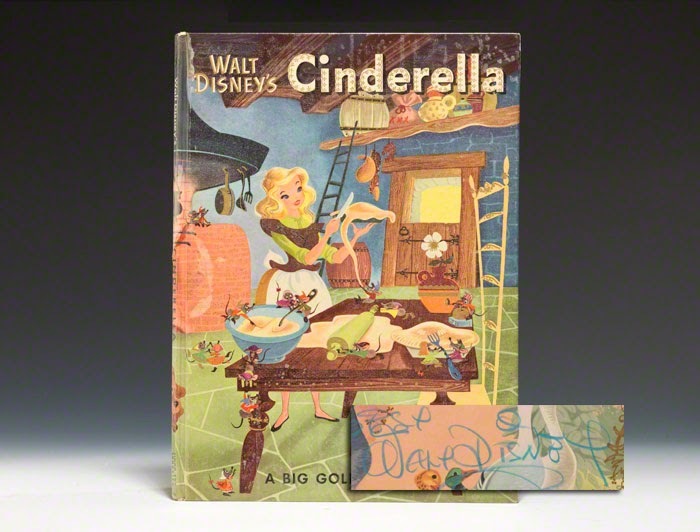 The Archives contain story materials on "Cinderella," though the artwork is all in the Animation Research Library. We have the press releases, press books, posters, and other materials that were used to promote the film, and a collection of the resulting reviews. There are also Cinderella toys, figurines, games, clothing, books, and phonograph records, not to mention hundreds of photos in our Photo Library. I really like the ceramic figurines of Cinderella, Prince Charming, and the mice, made by American Pottery in 1950.